Free Samples - Order Your Free Snap Domes Today! | Snaptron, Inc. Receive a free sample box containing various styles, sizes, and actuation forces of Snaptron’s wide variety of snap domes. 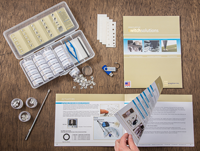 If you would like a particular dome included in your sample box, then simply list the part number(s) in the appropriate section. Sample boxes will be shipped to you by the next business day. Receive a free designer’s guide that contains information about metal snap domes, dome placement, circuit design, working with actuators and overlays, and much more. Your designer’s guide will be shipped to you by the next business day.